Is there laundry service at the lodge? Yes, we provide daily laundry service for you at the lodge. Just place your laundry in the white bag that is provided for you and place it on the end of your bed. Your laundry will be returned in the late afternoon on the same day. A small gratuity for the housekeeper would be greatly appreciated, please place it in or on the bag. Bring your own ice chest and leave it in your car so fish can be taken home fresh/frozen from your trip. On the return flight from Cedros, your fish will be packed in softsided cooler bags. Once you are back at the CBX, you will be able to transfer your fish to your coolers. Rosie will collect the cooler bags and get them back to the island for the next group to use. Does anyone at the lodge speak English? Richard is our host at the lodge. He grew up in Santa Barbara, CA and is fluent in English and Spanish. The rest of the staff pretty much only speaks Spanish, with a little broken English mixed in. Is there a place to get food and beverages? There are small markets on the island for snacks, shirts, beer & alcohol. Down on the beach frontage road, there are a couple small restaurants that serve authentic mexican cuisine. What about lunch while I'm out on the water? Breakfast, lunch and drinks may be taken on the pangas. A picnic lunch, including sandwiches or burritos, along with snacks and beverages will be packed up in a cooler on your panga. Your lunch and drink order will be taken each evening for the next day. Do you offer a vegetarian menu? Let us know of any dietary needs or allergies. Does Cedros have any specialties I should know about? The tortillas that are made on the island are amazing! Is there a place to buy tackle on the island? Yes! There is a tackle shop on the island. 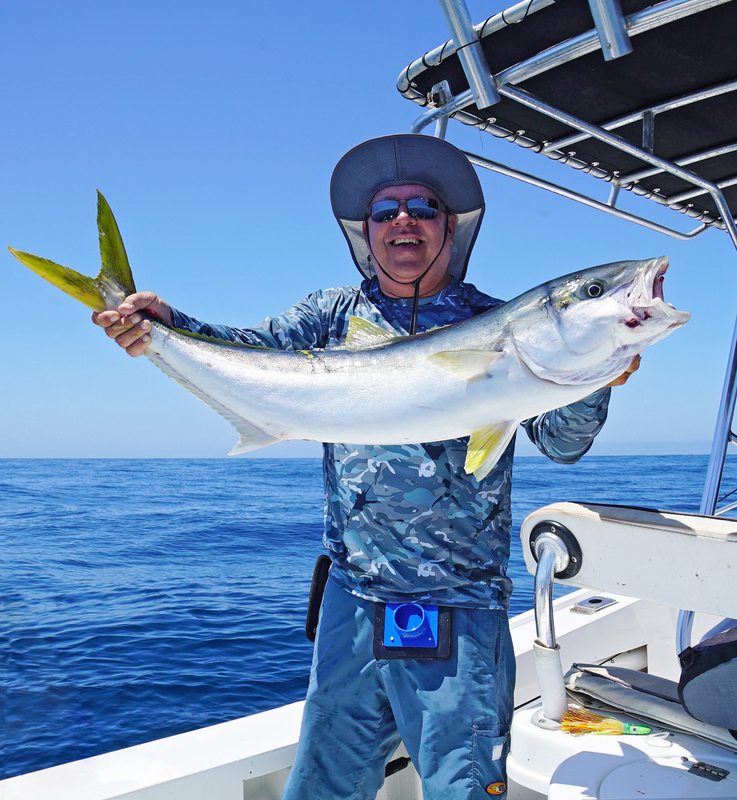 Cedros Tackle is owned and operated by Jeff Mariani. He takes U.S. dollars or pesos. If you need any tackle while on the island, Jeff is your guy and we will be more than happy to contact him and take you to the tackle shop. Is there an overweight charge or for more then 1 rod charge? In the past, there was an overweight charge and a rod charge for every rod over one. Now that we have our own chartered aircraft, there are no longer any charges for these items. One still needs to be mindful though of the weight they bring. We strongly encourage an overall weight of 30-35 pounds per angler. Remember we have a laundry service, so bring the minimal in clothing. Can I bring my tackle box? Small tackle boxes are encouraged. Softsided tackle bags, backpack tackle bags, duffle bags are all great for transporting you tackle. Larger longrange tackle boxes are not needed and only take up weight on the aircraft. Gratuity - There is a staff of 9 to care for all your needs including meals, laundry, fish cleaning, transportation and making sure you are well taken care of and comfortable. A gratuity is given on the last day of the trip and the staff will divide it. The panga captains are not employed by Cedros Sportfishing. They work hard to get you on the fish and help in assisting you in your catch. Please tip your panga captain daily. You have the opportinity to fish San Benitos island, but please note that there is a $100 surcharge, payable to the Panga Captain. Also, since San Benitos is quite a distant, approximately 1 1/2 hours, the panga captain must depart San Benitos by 3pm latest. Cedros Sportfishing, Isla de Cedros, Baja California, Mexico Copyright © 2017. All Rights Reserved. Website Hosting and Design provided by TECK.net Fish Counts provided by Sportfishingreport.com. All Rights Reserved.